Richard and Toby Beresford are Kindred Spirits for us at Sohodojo, the "War College" of the Small Is Good Business Revolution. Big Is Good is not a One Size Fits All solution to our increasingly global, social, economic, and environmental challenges. The Small Is Good World celebrates the creativity, agility, resourcefulness, and dynamism of the Individual and collaborative networks of Individuals in response to social and economic challenges. 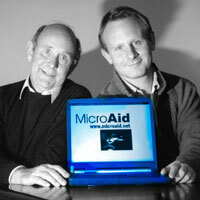 ...here we describe the nature of Sohodojo's evolving collaboration with the innovative MicroAid social enterprise. At Sohodojo, we practice a form of social entrepreneurism called change insurgency. We prefer to collaborate and participate in new or existing organizations to affect their 'service trajectory' rather than build and manage our own monolithic organization. We met Richard and Toby Beresford, the father and son team behind MicroAid, through our participation in the Skoll Foundation Social Edge on-line community for social entrepreneurs. At Social Edge we are self-appointed evangelists for the Small Is Good approach to social entrepreneurism. Even in the social sector and among non-profit service organizations there seems to be a too-often unquestioned assumption that 'going to scale' is a necessary step for organizations intent on affecting significant social change. The Small Is Good World lies in the domain of Individual Space where Actors (individual people) interact and relate to each other in social networks. In the Big Is Good World, we relate to each other in Organizational Space; we wear many hats filling Roles in Organizations. The software that both Sohodojo and MicroAid are working to envision and develop must recognize and synthesize the activity we engage in on both planes of this multi-dimensional space. Our change insurgency service to the Social Edge community is to be a persistent reminder that there is a new breed of social entrepreneur emerging. This new breed affects social change through collaboration in Individual Space rather than through management within Organization Space. Richard and Toby Beresford are prime examples of this new breed of Small Is Good social entrepreneur. Their mission is to transform the practice of international aid and development from the domain of nations and international mega-organizations into the domain of one-to-one support. They are, in other words, taking international aid and development from Organization Space in the Big Is Good World and reinventing it in the Individual Space of the Small Is Good World. The Beresford's goal for MicroAid is not to achieve significant social change by scaling their organization through accretive (getting bigger) growth. Nor do they aspire to grow by replicative growth through the creation of lots of little MicroAid's. Rather, they will achieve scale through transformative growth. Their work and personal/business example enables the power of an idea to infect and transform the thoughts and behaviors of those whose lives they touch. Through their efforts, the work of international aid and development can become a uniquely personal and interactive experience. We recognized and celebrated MicroAid's innovative strategy in our wrap up comment at the Social Edge event, "What Does It Take to be a Social Entrepreneur?" In the sections below we've pulled together links to Sohodojo articles that will help you to understand the dynamics and exciting potential of life in the Small Is Good World. We invite you to dig into the books we review and recommend below as they add weight to our Small Is Good World vision. And we invite you to dig deeply as well into the MicroAid web site. Our World may be small, but the social change it will unleash will be the biggest story of our time! How so? Take a look at the project that Sohodojo and MicroAid are working on together to enhance the marketplace competitive advantages of folks who choose to do business in the Small Is Good World. MicroAid Manager supports the creation of 'private label' Network Centers that allow community-based organizations and micropreneurs to envision, promote, fund, and track results of microbusinesses and community projects. If you already use or visited the MicroAid Family Charities demonstration site, you know that Toby Beresford has done an excellent job in developing an easy-to-use Internet platform for the 'front end' development and implementation of microenterprise and community development networks. Version 2 of this platform excels at managing the challenges of idea generation, microbusiness and community project planning and budgeting, and even the difficult challenges of fine-grained business and project funding and results tracking. What you don't see in the current MicroAid service offering – and what Sohodojo is uniquely qualified and ready to contribute to our collaborative R&D efforts – is an e-commerce engine to create sustainable alternative markets for the products and services planned, budgeted, implemented, and tracked using the MicroAid Manager platform. MicroAid doesn't need to tack on a run-of-the-mill 'shopping cart' module to bring its microenterprise network products and services to market. To do so would surely result in frustration and failure for the good folks working to achieve their business and community development goals. Marketing and selling products and services from the Small Is Good World requires strategies and support infrastructure that simply do not exist yet. In short, we need to envision and develop alternative markets based on "Who, How, and Why" purchase decisions rather than attempt to compete in the Big Is Good World's traditional markets based on "How much and Where" (price and distribution) dynamics. Sohodojo's vision for these alternative markets involves creating a unique shopping experience that is story-driven and game-oriented. We've written in some detail about the innovative requirements for alternative marketplaces in The Yin-Yang of e-Commerce Engines. The table at left shows that we can achieve unique competitive advantages in meeting consumer needs if we 'play to our strengths' and avoid the ruthless, price-driven markets of the Big Is Good World. Over the last few years, Sohodojo has worked to identify and nurture collaborative relations with researchers and technology providers that can play a strategic role in helping to envision and develop the business models and associated software technologies that will be needed to develop the Small Is Good e-Commerce Engine. Now, in collaboration with MicroAid, we are ready to move forward with applied research, development, and deployment in test projects literally around the world. What's needed for our success? First and foremost, we need a visionary project sponsor to fund our initial collaboration. We believe we have identified the single most appropriate and mission-dedicated collaborative sponsor we can imagine – Jeff Skoll and his Skoll Foundation. The Alternative Markets Feature Comparison table in this section identifies eBay as an example of the Big Is Good Agora business web. Jeff Skoll was eBay's first employee and its President who masterminded the business model that defined a new paradigm and successful public enterprise which is bringing wealth to thousands. While we cite eBay as a Big Is Good Agora business web success example, that is not entirely accurate. While eBay has one foot in the Big Is Good World of price-driven consumption, it was among the first Internet companies to firmly plant a leading foot in the Small Is Good World. eBay is all about empowering Individuals as buyers and sellers in a virtual community. Having experienced the power of one foot in the Small Is Good World, we believe that Jeff Skoll will have a significant interest in exploring the marketplace potential when both feet of a social business venture are firmly planted in the Small Is Good World. At present, we are developing visibility and potential interest at the Skoll Foundation by being regular participants in the Social Edge on-line community for social entrepreneurs. We're also developing contacts and finding out about requirements to submit a social venture project proposal to the Skoll and eBay Foundations. On the near horizon, we are seeking sponsor funding to get Sohodojo Jim and Timlynn to England in March for the Skoll World Forum on Social Entrepreneurship being held at the Said Business School at Oxford University. Toby Beresford is planning to be there (and maybe Richard if he is not in Indonesia). Sohodojo and MicroAid hope to attend this event together as unofficial ambassadors representing the emerging community of Small Is Good World social entrepreneurs. Our plan is to conduct a Birds of a Feather meeting at this event where we will do stakeholder, funder, and collaborator development for the Sohodojo/MicroAid Project. If the missions of Sohodojo and MicroAid interest you, and if you have skills, interest, and experience to contribute to our proposed collaborative project, we want to hear from you. Drop us a note here. Whether or not we succeed at getting sponsor funding, we will keep moving forward, chipping away at helping to populate the Small Is Good World. If you are a Kindred Spirit in this challenging adventure, welcome aboard the next leg in the flight of Spaceship Earth! While there are several hundreds of pages of content at Sohodojo about the Small Is Good World, here are a selection of links to articles and info bits that are most relevant to the collaborative R&D and social action agenda of the Sohodojo/MicroAid Project. The titles of especially relevant articles are boldfaced. Cross-Sector Partnerships: New Perspectives in Social Entrepreneurism - Tuning the Two-cylinder Engine of Capitalism is a hefty piece that consists of links to our streaming audio/visual presentation at the Wired.org conference and a transcript of the Q&A discussion that followed. Shamrocks and Nanocorps: Bridging the Digital Divide with Small Is Good Business Webs presents a strategy for using Small Is Good organization dynamics to open up a new category of entrepreneurial opportunity in rural and distressed urban communities. See how Charles Handy's Shamrock organization model plays a part in shaping Small Is Good Business Webs that can bridge the Digital Divide. Nanocorps in the Dream Society: How Small Is Good Business Webs Will Compete in the Story-driven Marketplaces of the 21st Century examines the ideas of world-class futurist, Rolf Jensen, to better understand the unique competitive advantage that nanocorps and Small Is Good Business Webs bring to the emerging imagination-based, story-driven marketplaces of the Dream Society. The Nanocorp Vocabulary is glossary/reference to help you explore the Small Is Good World; a realm populated by nanocorps, dejobbed small businesses, and microenterprise networks, among other emerging new business life forms. The Yin-yang of e-Commerce Engines extends Tapscott, Ticoll and Lowy's Business Web taxonomy to derive initial functional requirements for story-driven, game-oriented alternative markets of the Small Is Good World. This gets at the heart of the collaborative R&D agenda of the Sohodojo/MicroAid Project. The Nanocorp, Atomic Theory and the Network Effect: Organizing Principles and Scale in Small Is Good Business Webs is both an extended 'Big Idea piece' (part 1) and a detailed 'use case' scenario (part 2) envisioning how a Small Is Good Business Web (AKA microenterprise network) can compete in today's hyper-competitive economy. By developing marketplaces driven by "Who, How, and Why" consumer purchase dynamics, such alternative markets will make an end-run around the increasingly commoditized "How much and Where" markets of the Big Is Good World. Role/Actor Scenario Patterns: The A-Team and the Sandbox - A Pattern to Enable Nanocorp Replication (AKA Network Economy Job Creation) provides an example of how the social networking plane of Individual Space impacts effectiveness and opportunities in Organization Space. There is no book that makes a better case for the re-emergence of the Small Is Good World than Shoshana Zuboff and James Maxmin's The Support Economy: Why Corporations Are Failing Individuals and the Next Episode of Capitalism. A primary theme of this important book is that we are experiencing an historic shift in the underlying mindset/worldview of business. We are moving from the managerial Capitalism of the Industrial Era (Big Is Good World) to distributed Capitalism that will enable the evolution of decentralized Deep Support networks servicing the needs of consumers in their increasingly hectic and complex lives in Individual Space (in the Small Is Good World). Zuboff and Maxmin's underlying theory and historical analysis are outstanding. This is required reading by anyone wanting to better understand the emergence of the Network Society and its Network Economy. The future they envision, however, caters too much to exploring new market opportunities to meet the Deep Support needs of Road Warriors and Soccer Moms. But to the authors' credit, they preface their scenario examples with a strong statement that distributed capitalism will be realized in a myriad of ways by its creative participants. Richard Florida's The Rise of the Creative Class: And How It's Transforming Work, Leisure, Community and Everyday Life compellingly summarizes a provocative new theory and action agenda for local and regional economic development. Rather than focus on Big Is Good industrial infrastructure and recruitment efforts targeting corporate relocations, make your city or region a good place to live for Creative Individuals (inhabiting the Individual Space of the Small Is Good World)... and companies and jobs will follow them there. Beyond Civilization: Humanity's Next Great Adventure rounds up Daniel Quinn's provocative ideas about history, human nature, and our future and annotates them in a conversational question-and-answer style that is most enjoyable reading. Foremost among Quinn's Big Ideas that have shaped our thinking at Sohodojo are: 1) There is no One Right Way: Tolerance of diversity is one of Gaia's (Spaceship Earth's) survival strategies, not an abstract moral choice, and 2) Any social change strategy that requires individuals or corporations to become more saintly or to sacrifice in the name of simplicity or the Common Good is doomed to failure. The Age of Unreason could be subtitled, "Nanocorping secrets revealed!" No list of inspirational books that speak to the issues of work and life within the Small Is Good World would be complete without including the UK's prophetic and astute management thinker, Charles Handy. While a case can be made for including any of Handy's recent works – especially The Age of Paradox, The Hungry Spirit (AKA The Empty Raincoat in the UK), and The Elephant and the Flea – we've selected The Age of Unreason as it introduces his ideas of the Shamrock organization model, and Portfolio Life as a strategy for living in Small Is Good World. Linked: The New Science of Networks by Albert-Laszlo Barabasi is a wide-ranging and very readable overview of the application of the Big Ideas in network theory. Most of us are familiar with the Six Degrees, Strength of Weak Ties, and Rich Get Richer dynamics of social network theory. Familiarity is one thing, true understanding is another. Barabasi's book is a crash course in social network dynamics. Allan Cohen and David Bradford's Influence Without Authority should be on everyone's bookshelf. It was written in the eighties yet it remarkably remains in print and is even more relevant to today's world than it was to the world at the time it was written.